Round 1 of navy circle measures 1/2″ (1 cm) in diameter. With navy thread sew navy circle onto the center of the white circle. This entry was posted on Thursday, December 29th, 2011 at 12:32 PM by Emilee Gettle	and is filed under Free Crochet Patterns. You can follow any responses to this entry through the RSS 2.0 feed. You can leave a response, or trackback from your own site. Looks like a really easy pattern.. Lovely addition for crochet projects as well as other crafts. When adding white does not make sense. What ring, how many rings the flower does not look like a ring. The white appears to go around the navy in center. do you have better instructions? Do you have a YouTube video showing what your directions say. Hi Diana! 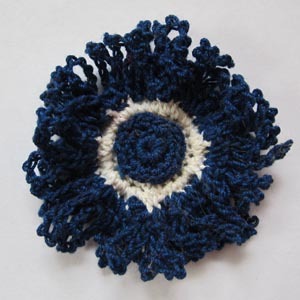 The navy and the white circles are crocheted separately, then sewn together at the end. They are both started using the same method. So we sew the two circles together and then the petals added? Yes, the petals are crocheted onto the white circle. Then in the finishing instructions it says the navy circle is sewn on top.